Servant leadership. Ethics. Entrepreneurship. Dr. Randy Gibb recites those principles slowly, carefully, with passion and intensity. They are his ideals. They are Jerry Colangelo’s. And their goal is to instill them in the Colangelo College of Business at Grand Canyon University. It has been five months since Gibb took over as dean of the college, two since Colangelo’s highly influential name was added to the signs on Building 35. The energy with which Gibb, a former Air Force colonel, has attacked his new role has been evident in a multitude of ways, beginning with the Fall Tipoff event, which drew more than half of the fast growing college’s 2,001 students to GCU Arena for a sneak preview of his enthusiasm, a chance to explore internships and other ways to get involved. “The energy there really excited me,” said Dylan Ju, an entrepreneurial studies freshman. The energy of the students has done the same for Gibb, who spent 26 years training Air Force pilots to be leaders. “I’m really impressed with their entrepreneurialism and how socially aware they are,” he said. The news cycle out of CCOB this fall has been a steady stream of major initiatives: Interns for Entrepreneurs and Seed Spot. “Conscious Capitalism.” Colangelo Scholars. The GCU Shark Tank. Master’s degree in sports business and bachelor’s degrees in hospitality management, golf management and business information systems are being developed. “I’ve been known to be a person who’s a dreamer,” Colangelo said. His impression of what’s happening in CCOB and, on a broader level, GCU is similar. The highlight of the CCOB school year thus far was the Sept. 25 event in the Student Union to celebrate the renaming of the college under the Colangelo banner and announce that two scholarships to the college will be awarded every year in his name. It was nothing short of a coronation, but make no mistake: With his servant leadership background, Colangelo will make sure his CCOB students are treated like royalty. He takes that litter-ally. As he’s walking to his office, Gibb picks up a piece of trash near the Quad. Gold standards are gold standards. At the core of what Gibb is trying to accomplish is a book that he wants every CCOB faculty member and student to read. “Conscious Capitalism,” which promotes an ethical approach to what it calls “the most successful form of human social cooperation ever created,” is what Gibb considers “just the right way to do business. “The whole point is that business is good and provides values for society, and we want all of our graduates to learn here to serve with a higher purpose, which aligns with the values of the University,” he said. But the CCOB emphasis on ethics extends to studying how business is conducted in the world around us, as demonstrated one fall day in an Introduction to Sports Business class. The topic was the controversy surrounding the handing by National Football League officials of domestic violence cases. Students’ critical-thinking skills were challenged as they discussed the core values involved in the league’s decisions, and instead of a textbook — obviously not applicable in the case of such a current event — they studied three articles published two days earlier and culled by Smith. “We’re not feeding you material that’s 20 years old. Here’s something that happened this morning, and we’re talking about it this afternoon,” he said. CCOB’s partnership with Seed Spot, part of the “Interns for Entrepreneurs” program, is designed to provide affordable help for startups as well as valuable experience for students. A group of students visited the Seed Spot office in October for “Venture Friday,” in which entrepreneurs being trained by the Phoenix business incubator delivered three-minute presentations. Gibb’s goal is to place 250 student interns in businesses of all kinds by next summer. LaJeunesse is a prime example of how the entrepreneurial spirit is intertwined with servant leadership at GCU. The Christian studies and finance/economics double major has launched his own startup, Overflow Bottles, to provide the funds for new sources of water in Africa. GCU President/CEO Brian Mueller loved the idea so much he said he would arrange to have the bottles placed in the campus bookstore. 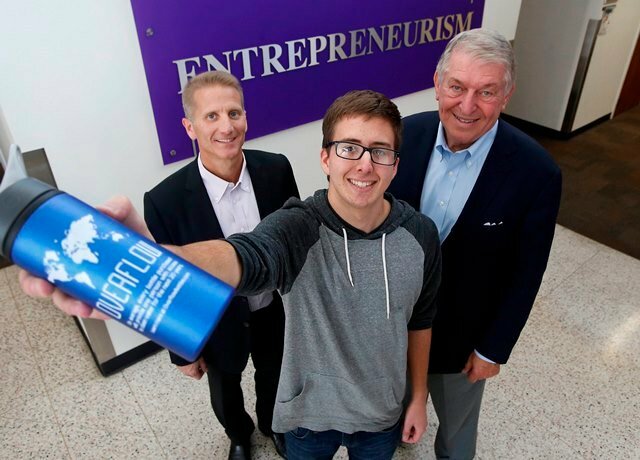 Gibb had a front-row seat for LaJeunesse’s presentation at the GCU Shark Tank, a monthly gathering modeled after the TV show of a similar name that is designed to let students see how their entrepreneurial ideas are received by an audience. Game time, with passion and intensity.